Congratulations are in order for the winners of the prestigious prizes presented at the WAPOR 70th annual conference awards banquet held in July. The Naomi C. Turner Prize is given for the best paper presented by a student, or in this case students, at the annual conference. 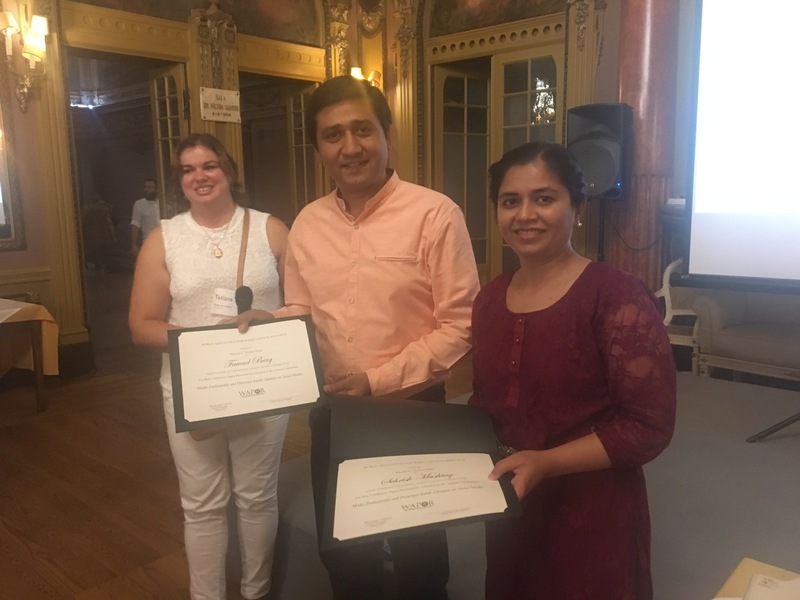 This year’s paper was entitled, “Media Partisanship and Polarized Public Opinion on Social Media” by Sehrish Mushtaq (right) and Fawad Baig (center) from the Technical University Dresden (with Tatiana Karabchuk at left, presenter and representative member of the award committee). Their paper explores how social media users respond to TV channels content in online environment. The article also looks at the level of partisanship in the content of posts related to politics shared by Facebook pages of TV channels. Further it attempts to figure out the level of polarization in people’s comments on the same posts. You can read the full abstract as part of the online program. The Elizabeth Nelson Prize is given for the best paper from a society in transition presented at the annual conference. The winner this year was for the paper, “Work Values and Job Preferences in Europe: Gender Aspect,” presented by Natalia Soboleva from LCSR Higher School of Economics in Russia. The paper investigates the effect of gender attitudes both on micro- and macrolevel on achievement motivation of men and women. The cross-cultural dataset allows the researcher to disclose both individual and country level predictors of female and male work values and job preferences. To read more about this work, the paper abstract can be found on our website. The Robert M. Worcester Prize is given for the best article in the IJPOR in the previous year. The winning 2016 article, “Off the Fence, Onto the Bandwagon? A Large-Scale Survey Experiment on Effect of Real-Life Poll Outcomes on Subsequent Vote Intentions,” is by Tom W. G. van der Meer, Armen Hakhverdian and Loes Aaldering from the University of Amsterdam. The article investigates the bandwagon effects in politics and aims to overcome the limitations of previous experimental and survey research. The authors test to what extent success in real-life polling outcomes of the previous weeks influences subsequent vote intentions. In this battle of online experiments conducted in the Netherlands, “Off the Fence” wins out for its ambitious design and scope, the longstanding theoretical puzzle surrounding its topic, and its likely stimulation of follow-up research. Read the entire article, and all of the past winning articles, online. WAPOR is always grateful for the help of the award committees who commit their time and effort to helping us choose the best papers and articles for these awards.